High quality photographs from Australia’s top nature photographers are accompanied by detailed species descriptions, which include nomenclature, size, distribution, habits and habitat. The user-friendly introduction covers the geography and climate of Australia, types of habitat, and details of orders and families. 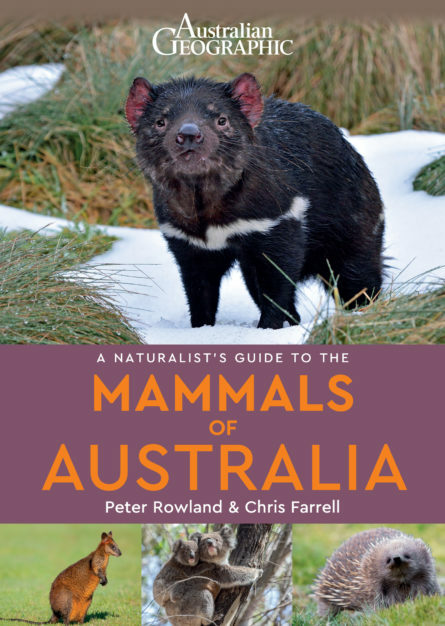 Also included is an all-important checklist of all of the mammals of Australia encompassing, for each species, its common and scientific name, and its global IUCN status. Peter Rowland is a wildlife conservationist, educator and nature photographer, and worked at the Australian Natural History Museum for a period spanning 30 years. Peter has travelled extensively throughout Australia as a biodiversity consultant, and has written several books and scientific articles on Australia’s wildlife. In 1999, Peter was the recipient of a Whitley Award from the Royal Zoological Society of New South Wales. Chris Farrell is a nature and landscape photographer who has spent the last 32 years behind a camera capturing the natural world and enjoying the ride. Chris is an accredited fundraiser for the World Wide Fund for Nature Australia, and is a strong campaigner for the conservation of Australia’s wildlife. Chris’s images have been used to study the movements and population trends of endangered animals, including the Southern Right Whale.